We have this treasure in earthen vessels, so that the excellence of the power may be of God and not of us. Continuing our three-year, through-the-Bible reading program. Is God your heavenly Father? 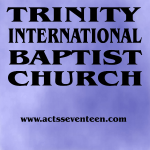 Trinity International Baptist Church is an evangelical assembly adhering to historic Bible teaching, with members and visitors from many continents, but with one common faith in Jesus Christ. Here is a link to a zoomable online map to our meetings. We meet in the 3rd Greek Evangelical Church building at 37 Chelntraich Street in the Neos Kosmos area of Athens. Greek Bible studies are postponed until further notice. You can reach us by phone at (+30) 210-932-6761.